Edinburgh’s Whitespace are one of Scotland’s leading creative agencies. 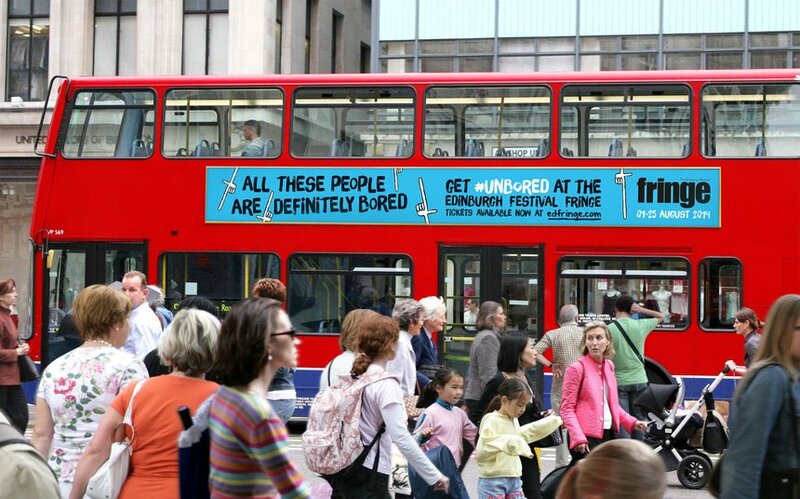 Their long-standing relationship with the Edinburgh Festival Fringe Society resulted in a striking and energetic #unboring identity for the 2014 Edinburgh Festival Fringe. We spoke to Neil Walker – Senior Creative, Mike Bryant – Senior Designer and Carolyn Gordon – Senior Account Manager, about the creation of this vibrant work. This is the sixth year we’ve worked with the Fringe Society. It’s all year round engagement, selling tickets online from January. So we have to have the creative from then. This year it’s also the Glasgow Commonwealth Games, World Cup, Ryder Cup and Scottish Referendum. That was part of the brief, the cut-through we needed to consider. It’s a challenge to get something that stands out and that looks different each year. The core target audiences are Edinburgh, London and Glasgow. Glasgow’s only 45 minutes away but it can be a challenge to encourage people to travel through. Apart from Neil.